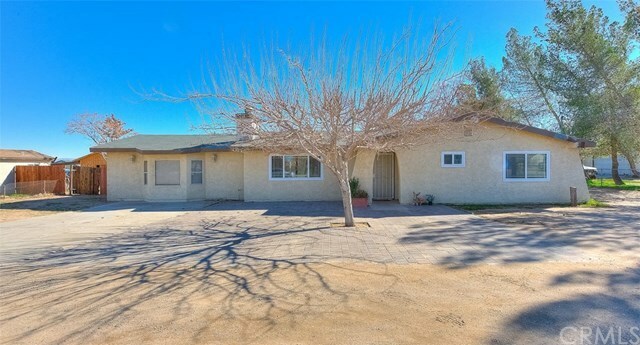 Nice single story home in Hesperia, features 4 bedrooms 3 baths, tile flooring through out most of the house. Large living room with fireplace, large dining area, kitchen has some upgrades with stainless steel appliances, laundry room area, double pane windows through out, master bedroom and master bathroom are adjacent from the other rooms for privacy. Additional 3 bedrooms & 2 baths, hall bathroom has new vanity. Large lot over an acre of land to do with it what you want. Plenty of front and rear parking, Garage is in the rear of the home and is detached from the home. Home is located with in a few minutes to the 15 freeway for easy access to all the local shoppes, restaurants and attractions.